Synthetic Paper Certified at RIT For HP Indigo. YUPOBlue® is Yupo Corporation’s synthetic paper made specifically for and certified to run on the HP Indigo line of digital printers. Perfect for short-run and customized pieces, YUPOBlue and HP Indigo give you the flexibility of using a superior substrate on those printing projects that must meet the tightest of deadlines. YUPOBlue is not compatible for use with inkjet or laser printers. *YUPO Packs are not returnable. YUPO® Synthetic Paper is not suitable for conventional office equipment (copier, laser/inkjet, fax). 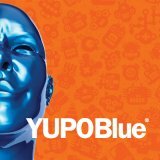 YUPOBlue® is Yupo Corporation’s newest synthetic paper made specifically for and certified to run on the HP Indigo line of digital printers. Perfect for short-run and customized pieces, YUPOBlue and HP Indigo give you the flexibility of using a superior substrate on those printing projects that must meet the tightest of deadlines.